As we start another year, we look back on the amazing year 2018 was, and forward in excited anticipation for what challenges and opportunities 2019 will bring our way. 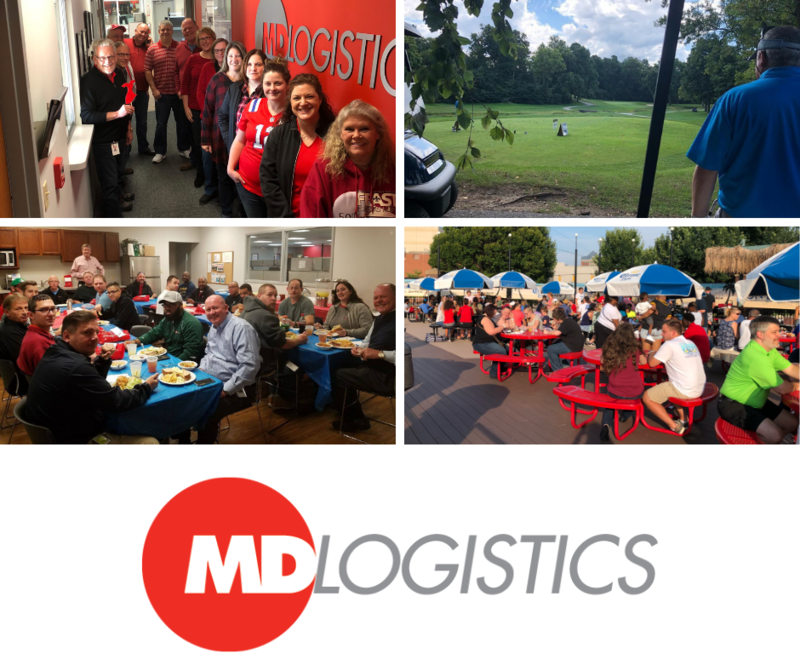 Perhaps the most exciting event of 2018 was that we launched the MD Logistics company blog! Throughout the year our team of experts shared their perspectives on a variety of topics, including: our internal response to pharmaceutical serialization, how our retail and consumer goods warehouse changes during Black Friday and the strategic reason we have warehouses located in both Plainfield, IN and Reno, NV. We discussed our own perspective about customer experience and how we try to ensure our customers and their consumer have the best experience possible. Finally, we explained and explored why our internal fundraising initiatives have had such an important impact on our company culture. We are excited to bring our perspective on industry leading topics to additional blogs in 2019. We also have some exciting guest appearances planned as well. You can follow along with our journey on our website or on social media by using the hashtag #MDbLogs. In addition to our blog, we also shared some expertise with the readers of Inbound Logistics on the advantages of using a niche 3PL provider and what you should look for. 2018 was a year of recognition for both our MD Logistics & SEKO Indianapolis teams. Our team is what makes us successful as a company and to see them recognized as a group is a proud achievement. The year started on a high note as President & CEO, Mark Sell, was named a 2018 Pro to Know by Supply & Demand Chain Executive for the first time. Mark’s ability to lead our organization to remain agile and flexible in an ever evolving industry is what landed him a spot on this year’s list. This attitude is what continues to keep MD Logistics at the top! We were also named a Top 100 3PL Provider by Inbound Logistics Magazine for the seventh consecutive year. Global Trade Magazine also named MD Logistics a Top 3PL in temperature controlled warehousing. This was the sixth consecutive year Global Trade Magazine awarded this distinction to MD Logistics. Our local SEKO Indianapolis office was also recognized in 2018 with the SEKO Logistics Enterprise Award for USA Top Performance and Highest Overall KP score in our market. While this award took into account revenue and gross profit growth, it went beyond financial performance to include our achievements in all around service metrics. This award is a direct reflection of the hard work of both our sales and operations team. In addition to the overall service award, Matt Collins, Director of Sales for SEKO Indianapolis was also awarded the Gold Award by SEKO Logistics for overall sales revenue/profit in the organization. This is the third time Matt has been awarded this distinction. This summer, we hosted an employee appreciation event at Victory Field, home of the Indianapolis Indians, for a night of baseball and laughter with our families. It was a great evening spent with our co-workers and their families celebrating the end of the summer and our professional achievements as a company. In the fall, we hosted the 11th annual Dave Kiebach Memorial Golf Tournament at the Country Club of Indianapolis. It was another successful year raising money for the David H. Kiebach Smile Fund in care of the Hendricks Country Community Foundation. More importantly it was a beautiful day reminiscing about our friend and co-founder Dave. We rounded the year out with a promotion of one of our own! We saw Emilie Gerbers promoted to Director of Business Development after previously serving as Manager of Business Development and Marketing. Emilie has been with MD Logistics since 2011 and during her tenure, has been instrumental in developing our brand and industry recognition while also contributing to our overall growth as a company. Congratulations Emilie! We also expanded our SEKO Indianapolis team! In September, Andrew Hadley joined our team as a District Sales Manager. Bringing more than 25 years of experience in the logistics industry, Andy brings an additional skills set to our sales team and is excited about the opportunity to work with our operations team to deliver innovative solutions to potential customers. Please join us in welcoming Andy to the team! 2018 was an exciting year, full of recognition and accolades. We are excited for the growth and expansion to come in 2019. Thank you for continuing to be a part of our journey.